Well, I decided to go for lots of little squares to put the embroidered squares together. I think it looks really nice. Just have to put a navy backing on it now and then quilt. Et viola! Now that the gown is finished I can move on to other projects. One of my cousins is due to have a baby in 4 weeks so I have started to make a playmat as a present. 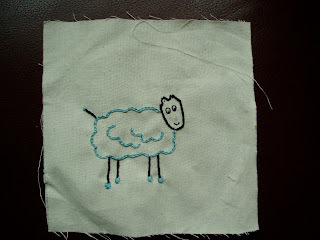 For this mat I've decided to embroider funny farm animals onto squares. 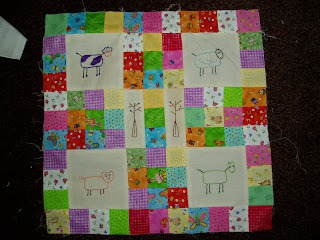 I'll then patchwork them together with other fabrics. Haven't decided exactly how I'm going to do that yet-either big blocks of colour or small patterened squares. the gown finished apart from putting fasteners on the back. The coat is well under way also. Just have to put sleeves together. Very slow progress on the crafting front at the moment. It's so hard to stay indoors when the weather is so good. And my sewing machine is in a north facing room so it doesn't get any sun. 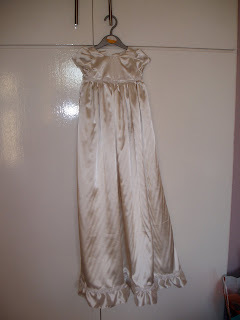 Have the trim added to the christening gown. Still have to put fastenings into the back of the dress - either buttons or press fasteners. Started the ruffled coat to go over it today but little Emily is having a growth spurt and needs to be fed every two hours so its hard to get a good run at anything. We've set a date of the 14th of June for the christening so need to get moving on finishing everything off pretty soon. Have started a knitting project for when I am sitting in front of the television - a large rag doll with some removable clothes for my Godchild, Rhianna, for her birthday. It's not til November so I should get it finished! Got some work done on the christening gown yesterday and this morning. Now have to put trims and buttons onto the dress. Then I can start on the coat. 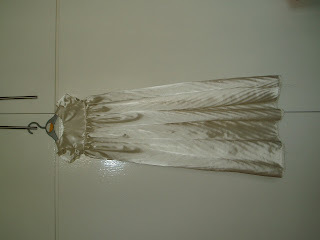 I'm using a partially sheer fabric so I will have to do french seams so it will take a bit longer to do than the dress. No crafting done this weekend. 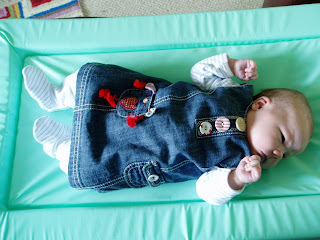 Need to get craking on Emily's christening gown asap - will post images of pattern when I get a chance. Spent the weekend doing family stuff. My granny and grandad visited on Saturday along with my Dad to see Emily. Then on Sunday we went out for a family shopping session and on Monday went to Dun Laoghaire to take a walk by the see. Had first breastfeeding session in public which actually went okay and also Emily had her first nappy change out in public. My Etsy shop seems to have gotten quite a few viewings but no sales yet. Keeping the fingers crossed. My baby girl, Emily, is now 5 weeks old and we are both settling into our nice happy routine at home. Spent the morning photographing bags and putting their details on the website. It's quite exciting. Some of my bags seem to have got viewings but I'll have to wait and see if anyone wants to buy them. Next step is to put some of my cards on the site also. Then if things take off (and I manage to get some time in the day to do stuff besides changing nappies) I can start doing lots of patchwork and quilting and can put some baby playmats on the site also.